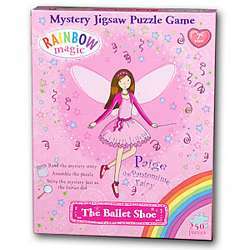 Read the mystery story, assemble the puzzle, solve the mystery just as the fairies did. Everyone loves the fun and sparkle of a pantomime, but this year Jack Frost and his goblins are out to cause mischief. First read the booklet inside, then complete the puzzle, this will need some sleuthing as there is no picture reference. Solve the mystery and help Kirsty and Rachel make sure that the show goes on. All the clues are in the puzzle. For the solution hold the answer page up to a mirror. Good luck and have a wonderful adventure!